Chone Figgins will begin rehabilitation stint Thursday with Triple-A Albuquerque. Chone Figgins, on the disabled list since June 14 with a left hip flexor strain, said he will begin a minor-league rehabilitation stint Thursday with Triple-A Albuquerque. He’s not sure how long he’ll need after missing 28 games leading into the all-star break. Friday, Figgins reported a grabbing sensation in the area of his left hip when he attempted to steal a base in drills, but he said that was the only lingering symptom of the original injury. (The team originally called Figgins’ injury a left quad strain, but Figgins said it was a hip flexor.) Now he believes the sensation was a byproduct of a lack of physical activity. “I think it’s going to continue to get stronger,” he said. Figgins said he will work out at Dodger Stadium Tuesday and Wednesday under the guidance of team trainers. The Triple-A All-Star Game, between the Pacific Coast League and the International League, is Wednesday. The Isotopes begin an eight-game homestand the following day. The Dodgers hit the road after the all-star break, visiting St. Louis, Pittsburgh and San Francisco before returning home July 29. It’s probable that Figgins will rejoin the team by the end of the month. Figgins has a .217 batting average and a .373 on-base percentage in 38 games this season. 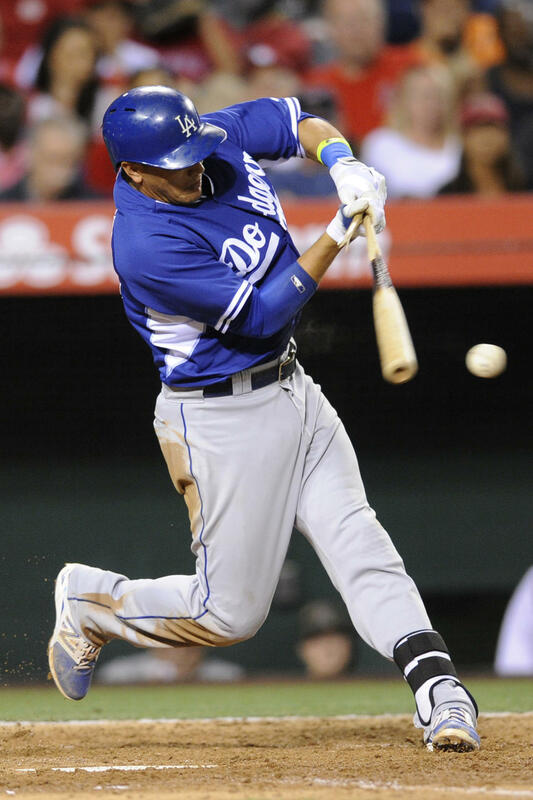 With Miguel Rojas starting at shortstop again, taking stock of the Dodgers’ backup infielders. It’s reached the juncture, again, where Dodgers shortstop Hanley Ramirez is being propped up by shoulder injections. The Dodgers seem to think that last night’s injection hit the correct spot. Time will tell. On Friday, for the fourth time in the last five games, Ramirez wasn’t in the Dodgers’ lineup. Miguel Rojas was. Ramirez’s health seems to be stuck on day-to-day, so it’s worth examining where his backups stand in what’s become a competition for fairly regular playing time. 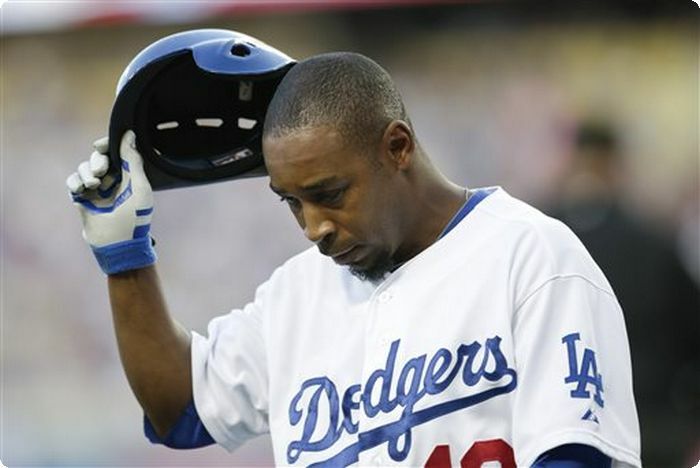 Dodgers’ Chone Figgins frustrated by latest injury. The Dodgers will soon learn more about the extent of Chone Figgins‘ strained left quad. Team physician Dr. Neal ElAttrache is expected to meet today with Figgins and pitcher Chad Billingsley, who was diagnosed with a torn flexor tendon in his right elbow. Dodgers manager Don Mattingly said that an MRI on Figgins’ left quad revealed “a significant strain.” Figgins, who was placed on the 15-day disabled list Saturday, has noticed improvement since he first suffered the injury Friday. Justin Turner scratched with tightness in calf. Dodgers infielder Justin Turner isn’t starting today because he has tightness in one of his calves, manager Don Mattingly said. The injury is not considered serious. Chone Figgins is starting at third base in Turner’s place. Turner took ground balls at third base prior to the game, moving laterally at less than full intensity. Since taking over for the injured Juan Uribe as the Dodgers’ everyday third baseman, Turner has a .349/.406/.540 slash line. Carl Crawford leaves Dodgers’ game against Cincinnati with a sprained left ankle. Update. Carl Crawford sprained his left ankle in the eighth inning of the Dodgers’ game against the Cincinnati Reds on Tuesday night. The 32-year-old rolled the ankle on the turf while fielding Chris Heisey‘s double into the left-field corner. 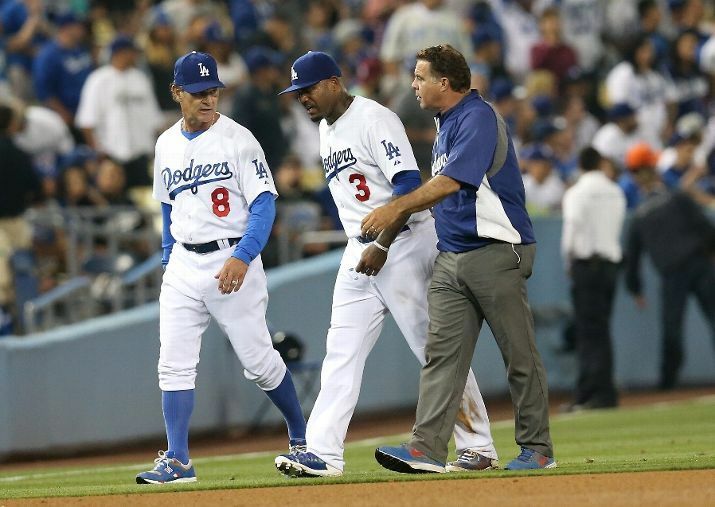 He had to be helped off the field by head athletic trainer Stan Conte and was replaced by Scott Van Slyke. A picture of Crawford’s ankle as the injury occurred can be found here. Update (11:15 p.m.): Crawford said he will be placed on the 15-day disabled list Wednesday. “I think it’s going to take a while,” he said. The injury is severe enough that Crawford entered the Dodgers’ clubhouse after the game in a wheelchair. He then limped into the showers and came back to his locker wearing a protective boot.